Auto Meter Arctic White Gauges feature a unique domed lens that delivers the appearance of a factory-style gauge cluster lens. Arctic white gauges have traditional incandescent lighting that illuminates around the perimeter of the dial and have a white face with chrome trim ring that can accommodate any interior. Race proven air-core instruments provide quick and accurate readings and can withstand the rigors of competition use. 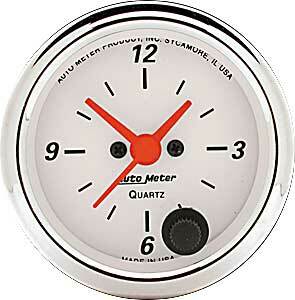 Arctic white gauges are available in most popular sizes and readings.